Sometimes you just have to take an unassuming, original four-door sedan that appears to have seen better days and stuff a big, fat engine in it. This is one of those cases. 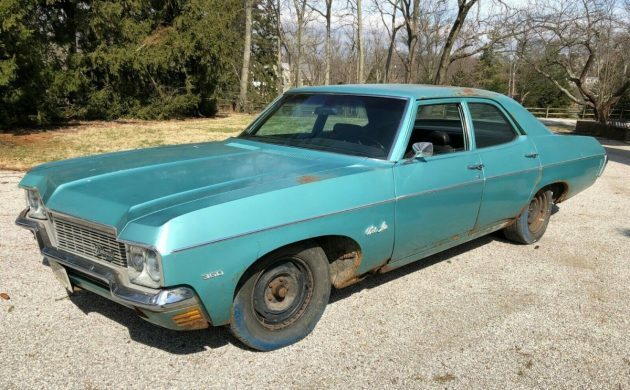 This 1970 Chevrolet Bel Air can be found here on eBay in Cincinnati, Ohio. They have a $5,500 buy it now price listed or you can make an offer. This is literally the era of car that I grew up with, or maybe more accurately, the look of car that I grew up with. Being born in the upper-Midwest, most of our cars looked like this Bel Air within a few years due to the road salt. No wheel covers? Check that off the list, too. I can almost hear the exhaust on this car now, or what a person would think is the missing exhaust. But, this car has a surprise lurking under that rust and those black steel rims and oddly-blue-painted tires. 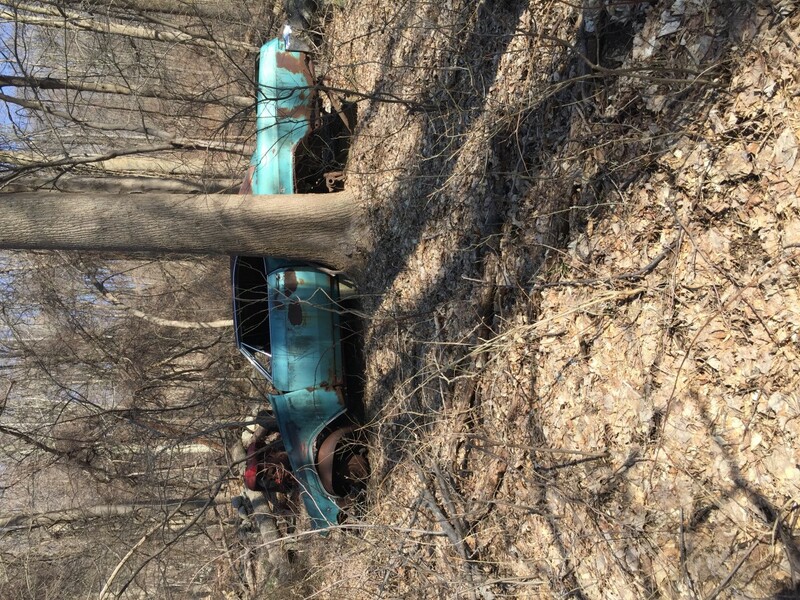 The seller mentions the rust on the body but says that the floors and trunk floor are solid. 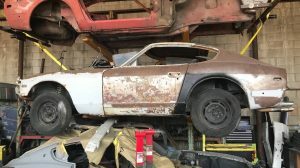 It was a barn find and it sure looks like it was. They say that the interior is original and like new and other than needing a thorough cleaning it does look good inside. They resisted the temptation to put a 4-speed in this car, it instead has a Turbo HydraMatic 400 automatic transmission. 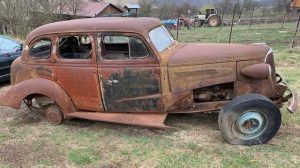 The big dealio with this sedan is this chunk of iron which the seller says is a Chevy 402 cubic-inch big block which was bored .030 over stock and has two thirsty 600 Holley carbs and a solid lifter cam. I can hear it idling now. And about that exhaust, it’s a new 3″ system, now I can really hear it! They don’t mention the horsepower, what’s your guess? This would be such a fun car to daily drive if a person could afford the gas. Have any of you done anything like this with an unassuming car? Reminds me of Clint Eastwood’s Walt Kowalski in “Gran Torino:” “Ever notice how you come across somebody once in a while you shouldn’t have f’d with?” I’m assuming the manual brakes are all drums, adding a layer of complexity to the mental calculations necessary before each application of horsepower. A few more covert upgrades and you could have a cool long-haul freighter, one you can park anywhere, because would-be thieves don’t want to join the other bodies in the trunk. being the one time owner of a 70 Kingswood wagon I can attest to need for at a minimum disc brakes on the front of this beast. these cars are downright dangerous without them. I rolled into an intersection more than once with mine before I replaced the front drums for discs. 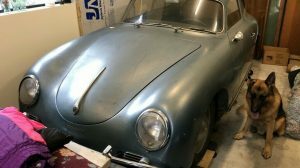 kinda neat but way to much carberation and I frankly do not see 5500$ worth of car here, but good luck to the seller! The engine and trans are worth the price alone…add in the fun factor of this sleeper, and it’s the bargain of the month! Sleepers are great and I have nothing against 4doors – however this is much more rat rod than sleeper really. 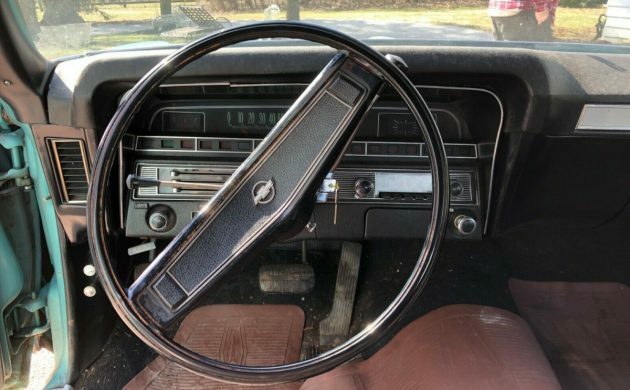 As for the ‘like new’ interior; did Chevy dealers include mildew in the deal back in 1970? And why disconnecting the heater? I mean, if you’re able to throw in a dual carb BBC you know how to replace a heater core? Close enough to make a Supernatural 67 Impala tribute on the cheap. 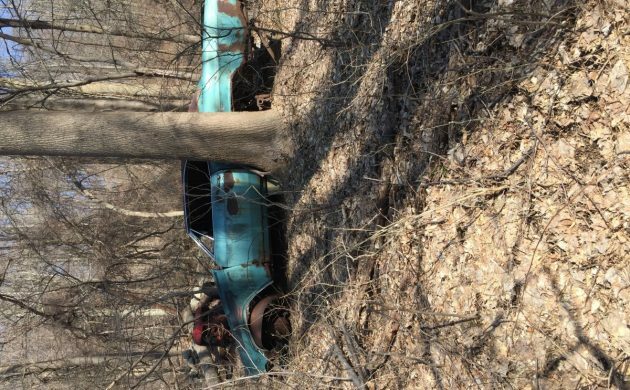 I wish this poor impala in my neighbors woods had another chance. Sorry about the sideways pic. He had a 6 I think. Same color. Car is from Dirty Mary Crazy Larry when they robbed the bank. Jumped the bridge. That was a ’66, but yeah, this reminds me of that movie. Seller is REALLY missing the boat here by not providing a “walk-around” video at idle. Pausing at the rear for a little longer than necessary! It probably would have sold already! It probably does fantastic burnouts, but it needs fatter tires on the back to get that power to the ground. I ran a 350 horse 396 for almost 50 years, and I had to run tires with an 8 inch tread a reasonable amount of traction on the street. Don’t think I have become more sensible, I recently upgraded to a 454, and yes, it is in a sleeper. I know quite a lot about GM Pontiac engines and enough about Chevy engines too. BUT I don’t know a lot about a Chevy Big Block 402. 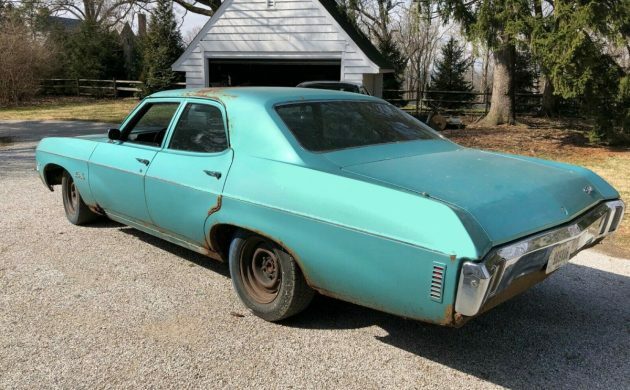 THOSE WHO KNOW…..Correct me if I am wrong but I believe my brother bought a new Monte Carlo in 74 with a 400 small block. Later replaced it with a 70 350 small block….blocks both looked the same so just thinking same block different bore and internals.? Back to the 402BB……. So if I am right so far, Chevy built a 400 small block AND a 402 Big Block? What vehicle and years did the 402BB come in for the most part? Just tryin to learn. Thanks! Tom. The 402 big block was a 396 big block with a slight over-bore. Even though it was 402 cubic inches, it was still listed at a 396 in brochures because GM had an internal ban on engines over 400 ci in intermediates. Sure, it seems odd to have a small-block 400 and a big-block 396/402 often in the same car. But the 400 was more of a torque motor and the 396/402 was the performance choice. I had a 402 that was the original engine in the 1/2 ton that I bought it out of. A 402, was nothing more than a 396 with .030 thousanths overbore. My understanding of those years, was that if the person ordered a 400 two barrel, he got a small block. If the person ordered the motor with the optional four barrel carb, they got the big block. There was nothing special about the 402. That’s true about GM’s ban on 400cid plus engines in mid-sizers. The 402 shows there’s no rule without exception simply by denoting it to the original 396. Buick’s 401 Nailhead was accepted in GS Skylarks too. The 400cid limit is also the reason for building Hurst Oldses. So you’re saying the 402 was not a W series engine? I’m a little confused. BR; the W engine was Chevy’s first BB offered in 58 to mid-65 model years, introduced with 348 later 409 cubes. They sport very distinctive W-shaped valve covers, see pic. 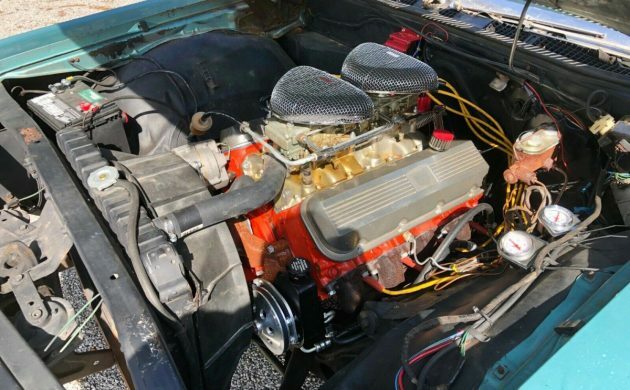 Midyear 65 came what is commonly known as the big block Chevy.Introduced with 396 cubes, it was also the basis for later 402,427 and 454 variants. GM didn’t want their mid-sizers to interfere with their fullsize market, hence the 400-up ban. That’s why we got 442s and GTOs with respective 400 engines.Chevy’s 396 was bored out to 402 , still called ‘396’ in smaller cars, but ‘Turbo Jet 400’ in fullsizers! 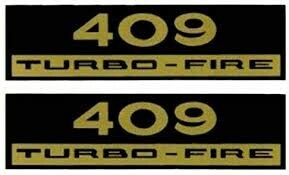 Turbo Jet is a nomenclature used by Chevy to indicate BB, as ‘Turbo Fire’ for SB. 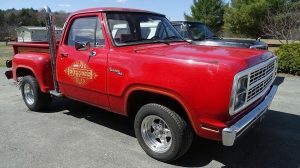 Chevy SB 400 was available 1970-80 as a non-performance, rather high-torque engine for fullsize and truck use. Though it’s a SB in design and look it has many 400 specific internal differences contrasting the more similar 350-down SBs. And then there are those aftermarket stroker variants too…! And before someone chimes in to correct me; the W-series BB available to midyear 65 was also called ‘Turbo Fire’ by Chevrolet, so to add to the cunfusion. The ‘Turbo Jet’ name was used on mid 65 onwards big blocks. Hey Tom, 350 was internally balanced, 400 was externally balanced. 402 was actually a 396, something to do with easier marketing. You could put a 150k mile 5.3 LS truck motor with an E-Bay turbo kit in the car and drop a second off the 1/4 mile ET , and save a grand all at once . That 402 is pretty , but it’s better suited for anchoring your yacht . Sorry, but this Biscuit Chevy does nothing for me, other than the drive train. A nice Caprice comes to mind. IMO, yank the drive train, and put it in something else, and part out the remains. Maybe 5K, tops. In the late 1980’s a (at the time) friend had a plain-Jane 1970 Chevelle couple. 307 car, rusty, white with black vinyl top & oddly enough, a white bench interior. He stuffed a 427 out of a 1969 Bel Air squad car in it. Ever since driving that car, I have had a strange attraction to a plain looking beater Chevy with a big block! This car really turns my crank, especially at this price. Let’s see what the insurance company pays me for my Harley that got wrecked last night. I may find a place in my garage for a 1970 Bel Air! 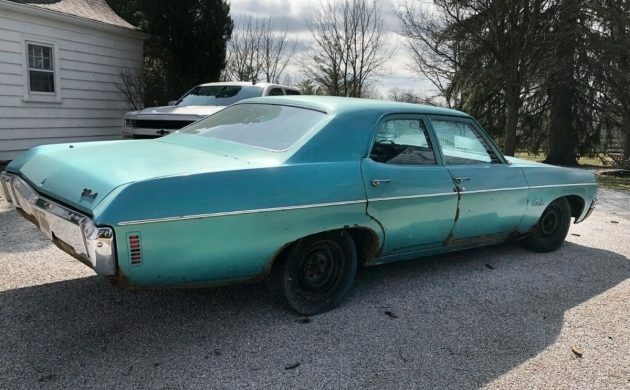 I bought a ’67 Ford LTD 4 door sedan back in ’77 from a salvage yard. No engine or transmission. Original 390-2V/Cruise-O-Matic car. Then I picked up a 460 from a ’68 Lincoln Continental and a C6 from a ’71 Ford Custom police package car. Put it all together one weekend and got it running and surprised a lot of people including me after fine tuning it. I had a lot of fun with that car. I’ve loved sleepers ever since.